The modern gamer’s greatest fear has manifested for redditor FlyingOfficer, whose digital library was recently wiped clean. While it had thousands of dollars’ worth of game purchases on it, including a pre-order for Battlefield V, EA allegedly deleted all traces of his Origin account and no longer has any record of his transaction IDs, order IDs, or game keys. Customer service claims they have no knowledge of what happened and has even deleted support requests. Thanks |-Goku-|. The significant attention the issue has received on reddit and other social media platforms saw an EA Community Manager, who goes by the reddit handle PartWelsh, step in. According to his own reddit post, he is working with Choudhury to resolve the issue. PartWelsh stopped short of revealing what exactly went wrong with Choudhury’s Origin account but did offer this advice at the end that could be a clue. nEo717 and captaindiptoad like this. Sounds more like a hack/personal attack. Seriously can't believe something as big as EA wouldn't have a back up server somewhere with this info. Very fishy. Armenius, trandoanhung1991, Nytegard and 11 others like this. Wow. I just happen to at this moment be refreshing offline copies of my GOG collection. This is what scares me about making a big investment into something tied to an online service. Snap of fingers and it's gone. At least some providers you are able to make backups that they can never take away from you. qb4ever, Armenius, trandoanhung1991 and 3 others like this. Agreed. I think there's waaaaaaay more to this story. Armenius, Archaea, trandoanhung1991 and 10 others like this. “Never share your personal account information with anyone claiming to be an EA employee. Please only share this type of information with our teams,” PartWelsh said. This could be an indication that Choudhury had given away private account information to someone, which resulted in his account being deleted. Giving away personal information resulted in EA losing all records of his account existing... sure. PaulP, Armenius, trandoanhung1991 and 8 others like this. Feeling justified in boycotting EA years ago after reading this story. Armenius, trandoanhung1991, Krenum and 4 others like this. I keep all emails in a special folder hidden away that contain online purchases. Armenius, trandoanhung1991, NeghVar and 7 others like this. Figured they would have a backup of this stuff. PaulP, Armenius, trandoanhung1991 and 5 others like this. Not enough. Print them out and put them in a fireproof box. It's the only way to be sure. Do that with important account login info, too. I call it making a [H]ardCopy. Armenius, trandoanhung1991, NeghVar and 18 others like this. the same as no one from origin or steam or even uplay will email you asking about your account info. Armenius, digitalwanderer and AceGoober like this. If that happened to me I would have a [H]eart attack. Outsourced customer service at its finest. Armenius, Bowman15, captaindiptoad and 1 other person like this. Shoe-in for a 3rd win. Armenius, Talyrius, dangerouseddy and 3 others like this. With how low cost it is to keep information now of days, all you need to do is set up sorting rules and backup the email folder every once and awhile. "We're going to need your password, credit card, social security number, and home address to verify your account"
BitMaster, Armenius, The Mad Atheist and 1 other person like this. And to really verify it's you I also need your mothers maiden name, the name of your first pet. your favorite author, your first car, your first job and your hobby. BitMaster, PaulP and Armenius like this. I was referring to an actual physical folder with printouts of my purchases above and beyond the digital copies. Armenius and heatlesssun like this. I wonder if an Origin support rep they had an argument with decided to spite them and delete their account and all records of it. Valve have a payment history for accounts where you can look at all the chronology of all your purchased games by date and price. 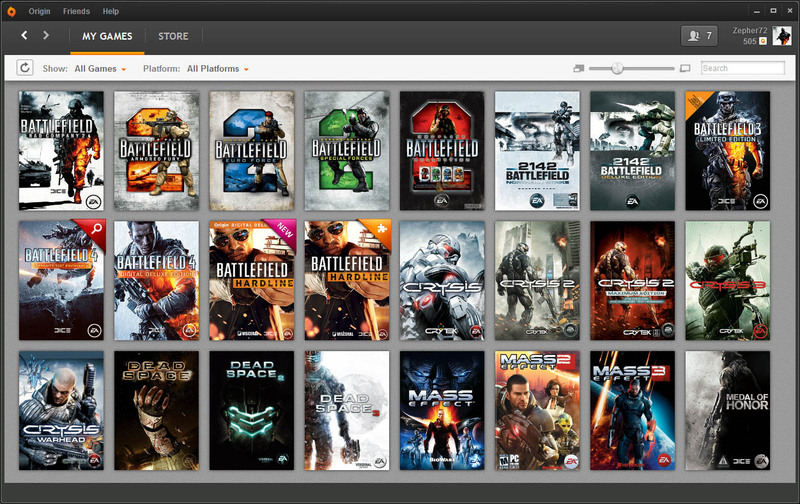 I wonder if Origin is lacking in its records-tracking by comparison. I had a similar response when my PSN account was hacked and the other person made his PS4 the primary account of my PSN... I had to file a complaint to BBB after been rudely hung up over the phone by PSN representative multiple time "S". Been primary on PS4 gives a lot of privilege like been able to play digital games using another PSN account and use PS+ online feature for example. I only found out when a family member tried to play a game and couldn't launch it... it could have been months that the hack happened.. since then 2FA. end of the story; a complaint with BBB solved the case in 2 days or so... happy that it's solved but I would like to know when my account is compromised so I can cancel my CC and all euh..
And this is another reason gog.com is first in list for my game purchases. Armenius and Meeho like this. I would hope so, too, and that records are permanent no matter whether an account is deleted or not. But, it's pretty strange that everything related to one person's account could disappear, including all supporting records. It sounds to me like it could be an act of deliberate sabotage. Why I won't heavily invest into any pure digital platform summed up perfectly. This will never happen they said, digital is foolproof they said, you're Luddite they said. Who's laughing now? Me that's who. Nytegard and Meeho like this. Yeah - this is fishy. Also, backup methods mentioned in here as "proof" of something are also no good. Screenshots can be fabricated and falsified literally in a couple of minutes with any modern graphics editing software. Emails prove nothing as those can be easily faked as well. Those examples are he said / she said and useless. Proof from third party sources can be helpful though. Payment methods can show proof of a purchase as neither side has the ability to falsify the third party (you can fake a PayPal email receipt or a credit card payment email) since the third party itself (the payment processor) can provide confirmation. Hard to believe they could internally wipe every trace of something. For a company that size with all the different systems to process and create and account and transaction someone would have to spend a lot of time manually editing probably a dozen or more databases. It could only be a high level IT DB admin likely to have a chance of deleting it all. Plus off-site and other backup archives. EA banned my account for no reason what so ever. All they will tell me is that it was due to a charge back even though I've never entered any payment info into Origin. Saves me from ever buying games from them again at least. Armenius, Drudenhaus, scojer and 3 others like this. Could be some sort of GDPR compliance thingy? Shhhh... Facts are bad for site traffic. It seems suspicious that EA can't derive what content was on the account from sales records. There may be a legal requirement to provide a method for users to delete account data permanently, but that shouldn't also delete company sales records. Surely there are laws to enforce some level of sales-data retention for tax purposes? Perhaps there is no legal requirement to store client information? Seems like an awesome way to launder money if that's the case. A point raised on his reddit post is that if EA has no sales documention that these transactions ever took place, then he can go to his bank and dispute. He has most of the receipts for the games, while EA claims it has nothing. Should be pretty easy to win. lcpiper, F.E.A.R., Armenius and 3 others like this. When my account was hacked many years ago I had no problem getting it back through EA customer service, although I did know the user name the account was changed to as the hacker didn't reset my friends list and they could all see the hacker playing. These days I've got no time for companies such as EA, haven't logged into that account for a good 18 months now. The most ridiculous issue I faced was that I had to make another account just so I could contact EA support. It sounds like a support issue. My theory is that there's most likely a unique ID associated with each account, but lower support can only search via active username/email, so when someone changes those (account theft) it appears as if it has been deleted. Lower support either can't or doesn't know how to escalate properly to the admins that can access the logs or do a proper query to see where the account changed to. The Reddit thread had a few others come forward with the same story. So it seems that the solution would be to either put proper support escalation in place or make the support tools also search the historical record - e.g. a search for an email would bring up all accounts that have ever had that email associated with them. lcpiper and lostin3d like this. Does this make sense. There would still be records. At least of the transactions and of the deletion itself. I'm pretty sure someone or two has begged to get accounts undeleted. I'd be shocked if they didn't have the abitliy to reverse a deletion in a short time. Ea is dumb then. A support person usually doesnt have direct access to delete every single thing aboit you. I was following his reddit thread, I was surprised that when he linked the support case it contained the support case and the access key in his link. But I'm thinking the warning was only pertaining to his support cases, not the actual account deletion.